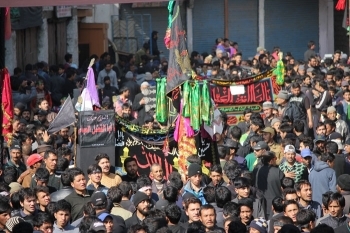 Thousands of people gathered in the mourning processions and observed the Arbayeen (Chelum) of Grand Son of Prophet Mohammad SAW, Hazrat Imam Hussain (A.S.) and his 72 diehard companions on November 11 in Kargil. The procession was carried out under the banners of Anjuman Jamiyat Ullama Asna Ashriya Kargil and Imam Khomeini Memorial Trust Kargil. Passing through Islamia School Kargil, Imam Khomeini Chowk, Lal Chowk and concluded at Inqilab manzil and Hussaini Park. Talking about the importance of the day, Hujjatul Islam Wal Muslameen Sheikh Nazir Ul Mehdi Mohammadi, President, Islamia School Kargil said that the philosophy of Karbala teaches to wake up against any kind of injustice and terrorism which leads to the destruction of humanity. He thanked the youths of Kargil for organizing Majalis and Procession from 1st Muharram to Chelum-e-Hussaini and told that participating in these activities inculcates Hussain’s character which is needed in this present era of the tense and anxious world. He further expressed gratitude to the district administration and authorities for the provision of all the necessary arrangements. Arba’een, occurs forty days after the Day of Ashura. It commemorates the martyrdom of Husain, the grandson of Muhammad, who was killed on the 10th day of the month of Muharram. Imam Husayn ibn Ali and 72 companions were killed by Yazid I's army in the Battle of Karbala in 61 AH (680 CE).